Due to the rather unlucky choice of using an iron cauldron for salt extraction, and then having the cauldron left outside, made the resulting extracted salt turn out somewhat impure to say the least. The resulting salt was somewhat greyish, looking and feeling almost like wet sand. 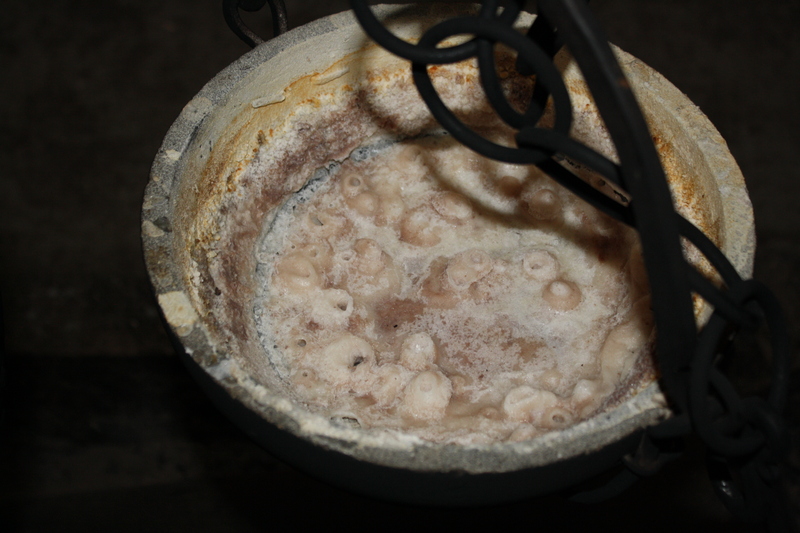 As I today hanged the remaining tongues to be smoked, I had a new opportunity to extract salt from old brine. This time I chose a smaller stone vessel that had a rather wide brim in order to get the best exchange, adding just some brine at the time in order to get a nicer and clearer resulting brine. As I was trying to cook it using this method I soon realised that while it worked well in order to get most of the salt gathered at the bottom of the pot it was not the best method for separating the proteins from the salt, Though I managed to skim of some of the proteins, it was soon containing quite abit of the salt I tried to save. Due to the mixture of salt and proteins, the liquid was also prone to form bubbles that would almost cause it to boil over the rim. While drying of course can be a viable option in order to preserve food such as meat, some salt may have been used in the Viking age cuisine around Lofoten. Salt is generally used for preserving meat, to preserve dairy products and in order to give your food taste. In this area I would assume that the order of importance would be go from dairy products as the most important to the use of salt as a taste enhancer as the least important. Though salt generally plays an important role in order to preserve meat, it could be possible that the strong winds and smoke could be used to dry the meat. In order to preserve any dairyproducts that are not supposed to be soured, however, there are no real option but to use salt. 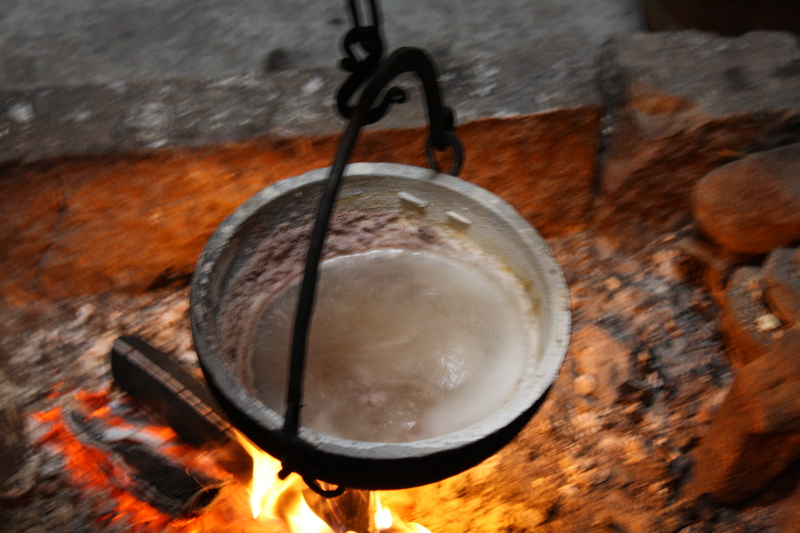 Though the sagas generally are uncertain as a source material the story on how Torarin puts is opponents head in salt, at the very least shows that salt for dry curing was available in the 12th century and possibly – since the salted head have a central role in that story – even earlier. For both cheese and butter I would think that salt has played an important role, even though one may store butter in bogs and cheese in smoke or piles of manure (Olaus Magnus). A soft cheese may be given a slightly longer longer life by subjecting it to smoke. However, in order to prolong the life of both cheese and butter salt would have been a quite important resource. Although many medieval stories, sayings and recipes point towards the importance of salt as a taste enhancer, this may indeed be the least of the uses of salt as a resource. A salty taste may be obtained indirectly by the salt that may have been present in meat, fish or dairy products. While it would be next to impossible to find any hard evidence for any salt being used in Lofoten, the importance of salt for curing and storing would make it an attractive commodity, and I would certainly have been an appreciated addition to the economy of a greater farm even at this latitude.